From Broughton Bluff on past the town of St Helens where it bends sharply north, the Columbia runs fairly straight and wide. The prominent bluff, named for a British lieutenant who explored the river in 1792, overlooks the Sandy River. Named the Quicksand River for the consistency of its banks and bottom, the Sandy was just one of many rivers that debouched into the Columbia. The silt brought by these rivers and the shallow, slow water created many islands large and small along this reach. After camping at the mouth of the Sandy, they paddled on. Encouraged by tidewater and the imminent success of their journey, they focused on the end goal and missed the Willamette River and the fertile valley it drains. They corrected this oversight on their return, but did have to backtrack to locate the river the native Americans had described. Clark traveled some distance up the Willamette, but not far enough to see Willamette Falls though native guides had described the area to the south and the fertile valley it drained. 13 miles below the last village, he entered the mouth of a large river, which is concealed by three small islands ... The current of this river is as gentle as that of the Columbia; its surface is smooth and even, and it appears to possess water enough for the largest ship. Its length from north to south we are unable to determine, but we believe that the valley must extend a great distance ... being naturally fertile, would, If properly cultivated, afford subsitance for 40,000 or 50,000 souls. 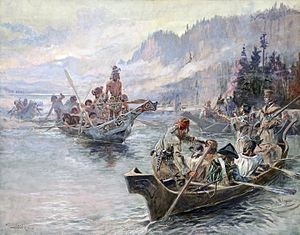 As the cultural changes of the native communities became as dramatic as the geographical changes of the landscape, the expedition of Lewis and Clark encountered a wide welcoming river, but taciturn, contrary natives. The cooperation they had come to expect was replaced by hard bargains and what they saw as petty theft by the natives known as the Skilloots. 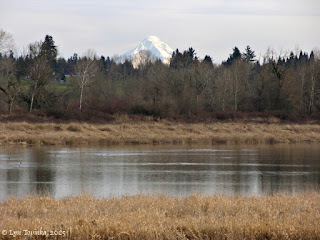 This Chinookan speaking tribe occupied both sides of the river between the Washougal and Cowlitz Rivers. They had a fair sized village where the airport is located and a large village near the mouth of the Willamette; and they effectively controlled traffic and trade on the Columbia acting as middlemen for all tribes between the coast and the Dalles. Lewis and Clark commented on the many European articles, from guns to buttons, that the Skilloots had stockpiled. The bounty of the sea, the river, and the surrounding woods made for large populations and the leisure to develop diverse local customs. Trading had become a major part of this way of life. Early 18th century population estimates place as many as 80,000 natives along the river. With the coming of European traders, the lives of the Chinookan people changed, and the change was not for the better. Disease swept the tribes. By the time of Lewis and Clark, 1805-06, the native population was reduced by half. Initially smallpox emptied the villages, but successive waves of malaria, measles, and influenza also took a heavy toll. Population estimates tell the tale. By 1780 there were 20,000 natives. By 1805, the number was reduced to 12,000. By 1850, only 4,000 remained. By 1910, 1,000 clung to desperate lives. Couple a skilled trader with a deep suspicion of Europeans and the attitude the expedition encountered is easy to understand. Lewis and Clark met the hostility with some aggression; but, in general, managed to avoid any major confrontation. As they paddled on through the Coast Range and the cold rains fell, they had a bigger issue to deal with: the Columbia itself.